After leaving school Nick began a one-year foundation course at the Plymouth College of Art. Now armed with an impressive portfolio containing paintings of jet aircraft, trains, even wildlife, he was immediately accepted at every college he applied to join. He chose a course at the Falmouth College of Art in Cornwall specialising in technical illustration and paintings of machines and vehicles for industry. It was perfect for Nick, and he was to become one of the star pupils. One of the lecturers commented at the time: "Every college needs someone with a talent like Nick to raise the standards sky high; he carried all the other students along with him, and created an effect which will last for years to come." Two weeks after leaving art college Nick blew every penny he had on a trip to South Africa to ride the great steam trains across the desert, sketching them at every opportunity. Towards the end of the 1980's Nick had the chance to work a major publisher. This was the break that for years he had been striving towards and with typical enthusiasm, flung himself into his new role. After completing a series of aviation posters, including a gigantic painting to commemorate the seventy-fifth anniversary of the Royal Air Force, Nick's first aviation scene to be published as a limited edition was launched in 1991. Despite the fact he was unknown in the field, it was an immediate success. Over the past many years Nick has earned a special reputation for giving those who love his work much more than just aircraft in his paintings. 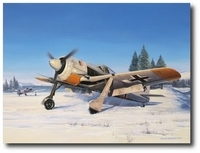 He goes to enormous lengths with his backgrounds, filling them with interesting and accurate detail, all designed to help give the aircraft in his paintings a tremendous sense of location and purpose. His landscapes are quite breathtaking and his buildings demonstrate an uncanny knowledge of perspective but it is the hardware in his paintings which are most striking. Whether it is an aircraft, tank, petrol bowser, or tractor, Nick brings it to life with all the inordinate skill of a truly accomplished fine art painter. "The Battle for New Years Day"